Tremendous forces will be exerted on the ITER machine when plasmas begin pulsating inside the vacuum vessel. As a consequence, the machine's support system needs to be both extremely robust, with a strong connection to the Tokamak Complex basemat, and yet also accommodating to the wobbling, expansion and occasional displacement of 23,000 tonnes of mass (tokamak plus cryostat). 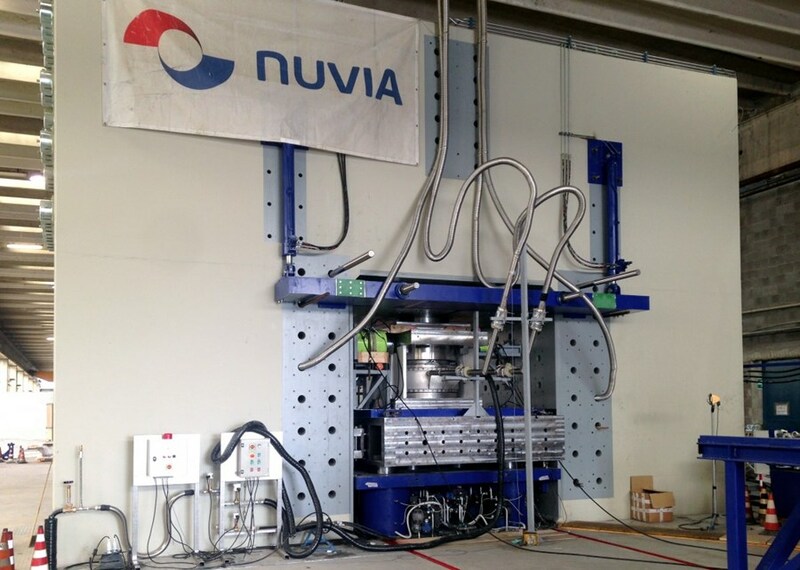 In order to simulate the vertical compression forces that the bearings may be subject to, a powerful hydraulic press—capable of delivering up to 7,000 tonnes of vertical pressure—was purpose-built in the Nuvia facility near Milan, Italy. 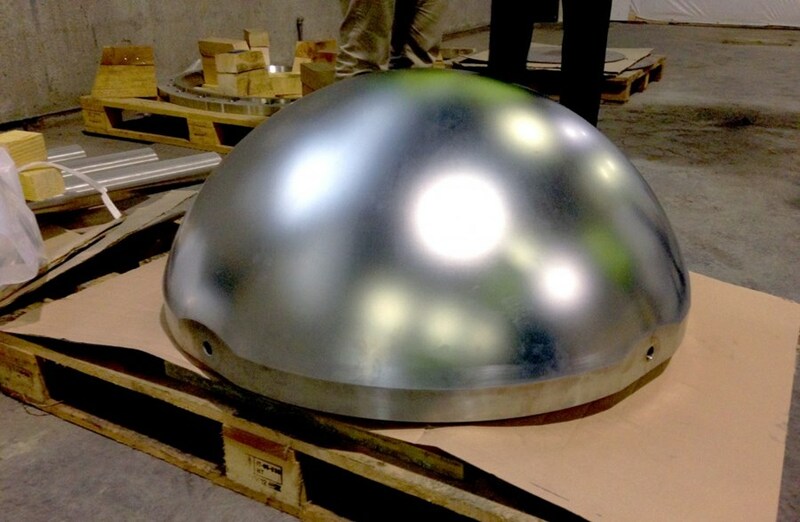 A massive pedestal—connected to walls that are radially anchored into the three-metre-thick bioshield—will allow for the even distribution of loads and efforts; a set of 18 spherical bearings acting like ball-and-socket joints will allow for the smooth transfer of horizontal, vertical and rotational forces, whether stemming from normal operations, a vertical displacement event or an earthquake. Spherical bearings (semi-spherical actually) are commonly used when large structures, such as bridges, need a small allowance of movement. But while mechanical constraints can be compared, a tokamak's environment is quite different from that of a bridge: radiations and extreme temperature gradients (from 35° C down to minus 100) require specific materials and techniques. At a facility near Milan, Italy, two full-size bearing prototypes have entered the qualification phase at Nuvia—the ITER contractor that also designed and installed the anti-seismic bearings of the Tokamak Complex. Made of high-resistance steel, the 18 cryostat bearings play an essential part in accommodating the wobbling, expansion and occasional displacement of the 23,000 tonnes that represent the combined mass of the Tokamak and cryostat. In order to simulate the vertical compression forces that the bearings may be subject to a powerful hydraulic press, capable of delivering up to 7,000 tonnes (1) of vertical pressure, was purpose-built. Equipped with additional jacks, the press also simulates the cryostat's lateral and rotational loads. An important factor in the behaviour of the bearings during both normal and incidental conditions is temperature. Because it can get as cold as minus 100 °C close to the bottom of the cryostat a small cryoplant has been added to the hydraulic press in order to inject liquid nitrogen into the test apparatus. The latest qualification tests mark the last step before launching the fabrication in late November. Further tests will be carried out during the manufacturing stage on the actual production bearings. (1) 7,000 tonnes represents about two times the force that could actually be exerted on each of the 18 individual bearings including safety provisions.